Saturday 7th – this being the last day of our stay at S.t Thomas for the Mail Boat has at length arrived, it becomes in pursuance of the rule I have laid down for myself, t say something of the town & the surrounding objects. I am sorry that my indisposition and the dreadful state of the weather will prevent me from giving you so many particulars as I would otherwise have done. I shall begin with the Harbour as of primary importance as containing in its bosom the town. The Harbour of S.t Thomas is a remarkably fine one. Rio on a very small scale. Enter with us – pass thro’ a narrow access commanded by forts on either side, and you find yourself in a pretty large basin, of a shape approaching to the circular – and you that [see] the deviations from the circle, are gentle sweeps, curves, or recedings of the line of shore, forming snug births for vessels anchoring during the hurricane months. Right opposite you as you enter stands the clean and picturesque town of S.t Thomas, but before saying any thing of the town, I shall take you round the Harbour. On your right is a conical shaped mountain of considerable height, on one of the lower slopes of which is a house & flag-staff. This (the house) attracts your attention because it stands by itself. Then this mountain at its horizontal boundary runs down into a hollow, when the lands again ascends, and constitutes a regular chain, or rather an almost unbroken line of pretty high hill, which encircles [a] good two thirds of the Harbour. The rest of the Harbour, coming round to the left entrance is formed by an island of much less elevated ground than the rest, which curving considerably, affords excellent anchorage during the hurricane season. Most of the hills are abundantly covered with wood. I should rather say brushwood, for I saw no large timber. In the curve of the small island forming the left side of harbour, is what is called the Dock, where the ships of war belonging to his Danish Majesty are repaired. It is perfectly insignificant in appearance& extent, & seldom if ever used. Here the Packets also are permitted to anchor, but none of the merchantmen – & here then we lay for 8 days, very close in [to] the shore of the little island. Twice I went on shore – which occupied only five minutes in doing – and found only narrow footpaths amongst trees, shrubs & creeping plants. I enjoyed myself much there – rambled about with the eager curiosity of a child let loose from school – here pulled a beautiful flower – there cut down a branch of some unknown tree – & occasionally plucked some unknown fruit. With these occupations I spent on shore an hour or two, forgetful of the lapse of time. My hands during that time full & empty several times – for every step I took I saw some flower more beautiful than any I had yet seen, or some plant more, & in order to secure the more valuable, I threw away those, which had now no longer any charm in my eyes. As you may easily guess, I ended at last in bringing back nothing. But I am forgetting the description of the town, the remembrance of which will not so soon be forgotten. From the continuous range of hill I have mentioned, on the lower part, of it, there descends four prominences or excrescences, a short distance apart from each other, with considerable hollows between. On the one to the extreme right, as you face the town, there is a large house, with a tower, and flagstaff. On the other, three, part of the town is built. The hollows between these excrescences is also occupied with houses, & connected there on the hillocks into one uniform appearance. The houses are clean looking & white at a distance with red coloured roofs, which resemble tiles. At the top of the middle of the three little hills, one house is conspicuous for size & elegance – & at first I imagined it might be the Governor’s palace, but I was told it belonged to the Chief Justice. I was on shore several times. We landed at a large open space with every facility. Close to this was a large fort, well garrised [sic] & mounted with many cannon. From this open space, the main street diverged to the right and to the left, and first attracted our notice. We walked along its whole length, which is considerable, & peered about with great curiosity. It was full of stores, wholesale and retail. These, in general were very large, very substantial & the material was stone. The whole presented a great appearance of wealth in a comparative small space – but we [did] not wonder at this. 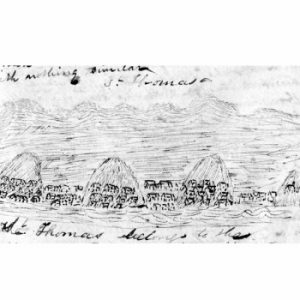 S.t Thomas formerly was a place of very great trade, being the entrepot of the West Indies – but now since we have opened up our islands to the Yankees, business here has fallen off very much. After visiting the principal street, we walked thro’ many others, and were much pleased indeed with every thing. In my own mind I ranked S.tThomas only after Martinique & superior to any of our towns. The (not so) whole of the houses seem to be of stone & very comfortable. The streets were pretty fair – not equal to those of Martinique or Guadeloupe. The situation of the town is the prettiest which I have yet witnessed – I have met with nothing similar. S.t Thomas belongs to the King of Denmark. It is a free Port, and during the war wealth was continually flowing in from all quarters. Strange to say, I heard the Danish spoken only once or twice – at every other time only the English by black & white. I forgot that I was in a foreign town, and entered any of the shops as confidently as at home, asking for what I wanted in my own tongue, not doubting but that I should be understood. Saturday 7th Sept.r – nearly a calm all day – much rain at times. VIIth Hebdomadal period. Little requires to be said at this period, for you already know how we have been employed. I have seldom passed a week more uncomfortably – for during the whole voyage, we had not so much bad weather as during our stay at S.t Thomas. Rain, rain every day – heat excessive – wind oftimes blowing a gale. Frequently we were under apprehensions, that a hurricane was about to blow – and were even very doubtful, tho’ notwithstanding the indications to the contrary which the great height of the mercurial column in the Barometer gave us. By day all this was bad enough when it occurred – but by night all the horrors of the storm & the suggestions of fear were increased a hundred fold – for thick darkness shrouded every shore from our view – the ship rocked to & fro, like a drunken man – and on one night in particular we expected to have been driven on shore, for the men, having forgotten to put a stopper on the chain cable, to prevent any more from running out – on the night in question the cable ran out with a tremendous noise, and before it could be stopped, we were not more than three [times] the length of the ship from the shore. Hence all of us were kept in a state of great anxiety & suspense – particularly the Captain & Master, whom I often heard talking of the measures necessary to be taken in case of extremity, should a hurricane, or furious gale come to blow. Our apprehensions were, you may be assured not lessened by our knowledge of the circumstance that not more than a fortnight ago, a large Dutchman had been totally lost not far from our anchorage. Besides the danger of getting on shore, of dragging our anchor, or loosing our masts, if not our lives, our health was very likely to suffer from the influence of the weather. The frequent rains chilling the air, & the succeeding broiling heat – alternating with each other many times a day, was likely to prove extremely injurious to the constitution – and I look upon [it] as a great instance of the mercy of Providence that none of us had an attack of fever there. I was the only one, who was attacked with indisposition, which being slight, and confined to the bowels, I was enabled, under the blessing of heaven, to conquer in very few days by proper remedies.